Even though the season two finale was called “No Mo’ Mojo,” The Hap and Leonard TV show has not been cancelled. In fact SundanceTV has just renewed Hap and Leonard for a third season. John Wirth will return as showrunner, and will executive produced with Jim Mickle, Nick Damici, Jeremy Platt, and Linda Moran. A dark comedy crime drama, Hap and Leonard stars James Purefoy and Michael Kenneth Williams in the title roles. In season two, the Sundance TV series also starred Brian Dennehy, Irma P. Hall, Dohn Norwood, Tiffany Mack, and Cranston Johnson. The third season will be inspired by Joe R. Lansdale’s book, The Two-Bear Mambo. Check out the SundanceTV press release for more on the Hap and Leonard season three renewal. NEW YORK – May 1, 2017 – SundanceTV announced today the renewal of the network’s genre-bending original scripted anthology series “Hap and Leonard.” The darkly comic series set in the late 1980s is based on the celebrated book series of the same name by famed author Joe R. Lansdale, and follows two lifelong best friends, Hap Collins (James Purefoy), an East Texas white guy with a weakness for Southern women, and Leonard Pine (Michael Kenneth Williams), a gay, black Vietnam vet with a hot temper. “Hap and Leonard,” SundanceTV’s highest-rated original series, will return for six episodes in 2018. The third season of “Hap and Leonard,” will take inspiration from “The Two-Bear Mambo,” the third installment of Lansdale’s book series. Season one was inspired by the first “Hap and Leonard” novel “Savage Season,” and season two from “Mucho Mojo,” the second book in the series. Each season of the anthology series features new supporting characters and a new mystery for Hap and Leonard to solve, with casting for season three to commence shortly. 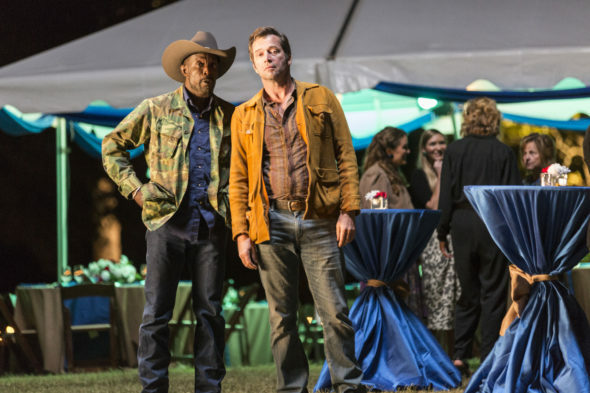 The second installment, “Hap and Leonard: Mucho Mojo,” debuted to strong critical notices on SundanceTV in March, with TV Insider calling it an “enjoyably rambunctious,” and Salon noting “Williams and Purefoy are an incredible…team.” In addition to its standout leads, the first two seasons of “Hap and Leonard” featured notable guest stars including Christina Hendricks (“Mad Men”), Jimmi Simpson (“Westworld”), Pollyanna McIntosh (“The Walking Dead”), Brian Dennehy (“Death of a Salesman”), Irma P. Hall (“A Family Thing”), Tiffany Mack (Wicked Love), and Cranston Johnson (“Atlanta”). “Hap and Leonard” is a wholly-owned original series produced by AMC Studios. John Wirth (“Hell on Wheels,” “Terminator: The Sarah Connor Chronicles”) will return as showrunner and executive producer for Season 3, and Jim Mickle, Nick Damici, Jeremy Platt, and Linda Moran return as executive producers. What do you think? Are you a fan of the Hap and Leonard TV show? Will you return for season three on SundanceTV? Tell us. Hell yeah. I can’t wait for season 3, It is different and I love James Purejoy. I loved him in the ****** series he (in my opinion) stared in with with Kevin Bacon. He has a way about him that is mesmerizing! (HE IS WHY I STARTED WATCHING THIS SERIES) I hope to see a lot more seasons of Hap and Leonard. Keep up the good work! great show. I like it because it’s different , and I really like the actors that are the main characters. I’ve watched both seasons and will watch as long as it’s on. Hollywood convinced the media (not too difficult since they’re part of the same companies) that there’s so many shows none can be a hit, but it’s just not true. Hell Ya, great show and i’m pumped that this program has been renewed. This may be the first show renewed by a cable channel(that also isn’t a pay channel, like Starz) that renewed a show with ratings under a 0.10 Unbelievable that TV has sunk this low, but everyone at Sundance must have job security. You are entirely correct. You can’t fire the people who ordered it, becuase you’d look foolish and they can’t cancel the shows they ordered because they’d look foolish. The result? A plethora of short-run shows nobody watches while their networks pretend they’re hits and brilliant TV. YAY! I was so disappointed when I read previously that the series would not continue past season 2, so I am very excited to learn now that there WILL be a third season! There really is nothing else quite like this on TV, and I have mucho enjoyed the witty writing, the acting ensemble, and the antics of the title pair from the beginning. Congrats to the whole team, looking forward to watching more!